For the miscellaneous requirements of our clients, we are engaged in offering a wide range of Wiping Rag all over the country. For the benefits of our customers, these products are quality tested on various parameters by the quality inspectors and are authenticated as per the international standards. Heavy cotton rags, heavy cotton wipers manufacturer & supplier of heavy cotton wipers. 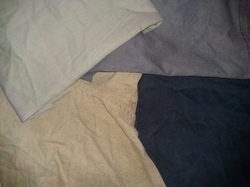 Cleaning rags are a great value for most cleaning tasks. Very durable and heavy duty wiper. We are regularly importing 1100 to 1200 tones of Woollen & Synthetic rags from different parts of the world such as Europe America & Far East. We are the leading names to provide our prestigious clients an optimum quality grade of Sweatshirt Wiping Rag. Also, this sweatshirt wiper can be availed by our clients at industry leading price. Enriched with vast industry experience, we are involved in trading and supplying a qualitative range of Light Denim Cut Wiper. Our offered wiper is weaved using the light denim fabric at vendors' end. As a quality driven enterprise, we are engaged in providing a high quality range of Fleece Wiper. This Cotton Flannel Wiper Rags is made from shirts, tops and other cotton rich coloured clothing. This is a versatile and absorbent wiping rags. We are among the reputed organizations, deeply engaged in offering an optimum quality range of Knitted Wiping Rags. We are engaged in offering high quality range of Cotton Wiping Rag to our esteemed customers. Enriched with vast industry experience, we are involved in trading and supplying a qualitative range of Light Denim Cut Wiper. Our offered wiper is weaved using the light denim fabric at vendors' end. The provided wiper is designed for cleaning window glasses, floors or any other solid materials. Cotton Wipers, Dust Cloth, Industrial Wipers, Knit Wipers, Linen Supply Wipers, Oil Absorbants, Polishing Clothes, Reclaimed Wipers, Shop Towels, Terry Clothes/Towels, Lint free wipers. This lightweight, pale coloured and cotton wiping rag is ideal for general day-to-day cleaning and maintenance. Appreciated because it is Lint-free. Adaptable and practical, this multi-purpose wiping rag is ideal for general use in all industries. Highly absorbent, it's perfect for cleaning up oil and coolant spills and wiping.